A couple years ago, Microsoft made a bet that we could deliver enterprise-grade internal apps on the Power Platform. PowerApps was pre-GA at the time and, like any nascent platform, it had gaps and bugs. But it showed a lot of promise. We could quickly build an app once and our users could consume it on their desktop, either standalone or embedded, and on any mobile device. Deployments were rapid: rather than waiting days to have an app reviewed (and possibly rejected) by an app store we could freely publish, fix, and republish our apps at our convenience. And the UI was rich and looked better than any off the shelf products we evaluated during our ‘build vs. buy’ analysis. Over time we built Thrive, a collection of apps that come together to make a no-compromises employee experience. We have the Home app, which gives the user tailored content and tasks cards based on their role and interactions with other systems. We have Time Away apps for the US and international subsidiaries, which allow users to report their time off, set Outlook automatic replies, and send calendar invites to their frequent contacts as suggested by Delve analytics. We added apps to give kudos to colleagues, browse the organization, see company holidays and add them to the calendar, attend internal conferences and network with colleagues, find mentors, and the list keeps growing. 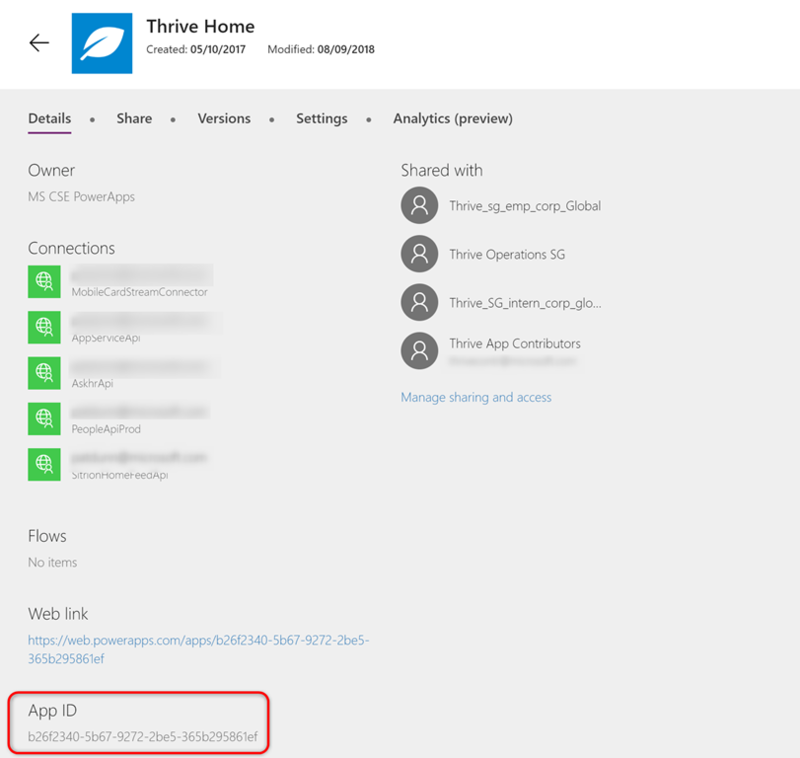 By all measures this has been a success: last month we had nearly 18,000 unique users in at least one of our Thrive apps. Our apps are consumed on mobile devices and the browser, either as a standalone web app, embedded in a SharePoint site, or exposed in Bing search results. The surest sign of success has been our growing backlog of scenarios to deliver – internal groups are clamoring for new apps and our biggest constraint is capacity, not capability. But PowerApps presents an interesting dichotomy in the enterprise: anyone with maker permissions can quickly create an app and share it with the whole company, while the IT department can use the Power Platform to create enterprise-grade applications connecting to corporate services. At Microsoft we literally have thousands of environments and many more thousands of apps. Many of these are throwaway apps or abandonware, with telling names like ‘Kyle’s Test App”. So how do you allow for healthy citizen development in your organization while ensuring that ‘official’ IT apps can be discovered and differentiated from citizen developed apps? This blog series describes the techniques we used to accomplish that. PowerApps always displays the original author of a PowerApp, so we log into our Production environment using our service account credentials to create the app. We grant Edit permissions to our development team and from then on any of our developers can update the app while still retaining the official IT author. 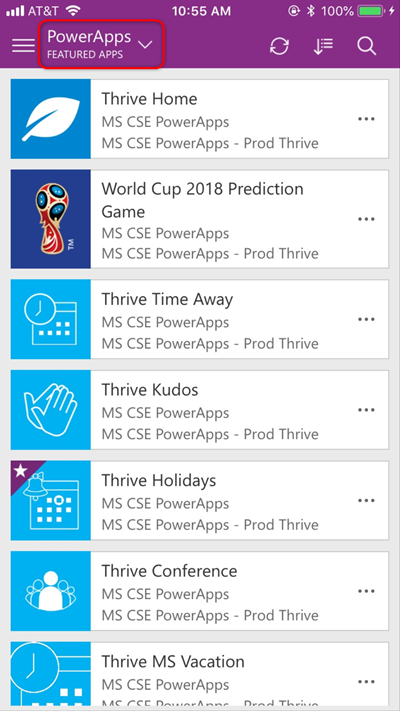 When a user opens the PowerApps mobile player for the first time, they’ll see the My Apps view, showing any apps that they’ve launched in the past. If this is their first exposure to PowerApps, this may be a lonely place. A quick tap on the dropdown at the top reveals different views for ‘All apps’, ‘Sample apps’, ‘Favorites’, and ‘Featured apps’. Getting your enterprise apps into the featured app list is a great way to increase your signal-to-noise ratio. Install the PowerApps PowerShell cmdlets for administrators. Get the App ID for the app that you’d like to feature. You can find this on the details screen for the application. The Featured app view is useful, but it does require your user to navigate to that view. 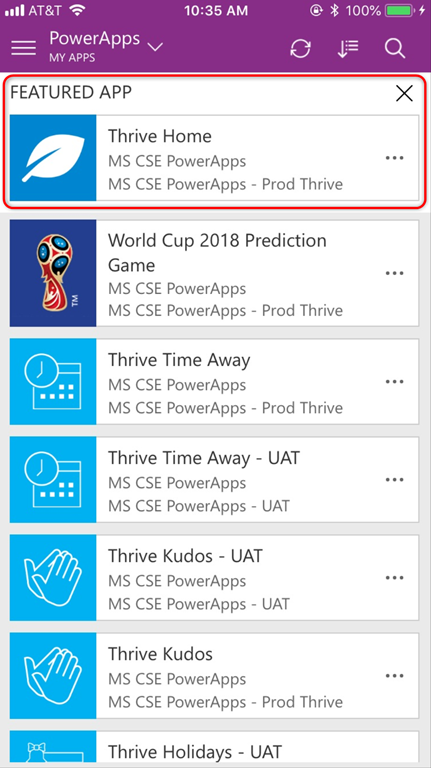 As an administrator, you have the ability to designate one of your apps as the Hero App, after which it will be prominently displayed in a tile titled “FEATURED APP” at the top of all views. For first time users, this is a powerful way to guide them into your enterprise experience. In my environment, my Hero app is Thrive Home, which is the launching point of the official IT experience. That app then has descriptions of, and deeplinks to, the other apps in the experience. Another way we use Hero apps is for campaigns or events. For example, we created an app for World Cup Soccer and temporarily replaced the Thrive Home app as the Hero app. We’ll also do something similar to drive traffic to our employee feedback tool in our upcoming performance management cycle. Unlike Featured apps, there can be only one Hero app at a time because of its prominence. To change the Hero app, first clear the Hero designation from the current Hero app with the Clear-AdminPowerAppAsHero cmdlet, then use the Set-AdminPowerAppAsHero cmdlet on another Featured app. Your Hero App will also display in the apps list on each screen. For example, in the Featured Apps screen you’ll see the Hero App in the FEATURED APP tile at the top and you’ll also see it in the list of apps that are Featured. This is by design. At the time of this writing, Hero and Featured designations only apply to the mobile player, but the upcoming PowerApps.com redesign in October will prominently show Hero and Featured apps on the web experience too. That’s it for now. There’s a lot more to blog about enterprise discovery, with tips and tricks around deep linking, URL shorteners, QR codes, and more. We’ll cover all that in upcoming blog posts!